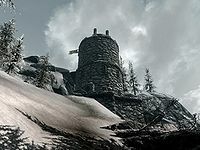 Snowpoint Beacon is a small, single watch tower consisting of three floors, found in Winterhold, south-southwest of Driftshade Refuge and due east of Fort Fellhammer. It is inhabited by bandits. The main path to the tower is from the north, where there are stone steps leading up to a doorway in the lowest floor. It is also possible to climb the mountain behind Fort Fellhammer to reach this tower from the southwest. From this direction you will reach the middle floor first. There is nothing of interest on the lowest floor with an internal spiral stone staircase leading up to the middle floor. At the top of the stairs is a large hole in the wall out onto a wooden platform. There is a bandit wielding a one-handed weapon keeping guard on this floor. Inside against an internal wall is a novice-locked chest containing minor loot with a mounted wolf head above it. To the left are a stack of crates with a small coin purse and two silver ingots on top. The internal staircase continues to the top floor where a bandit chief is standing looking out to the north, allowing you to attack from behind. There is a quiver of eighteen random arrows resting on a table. To the right of the table is a lean-to with an unowned bed roll under it and further to the right are some food barrels. Two corundum ore veins are located east of the tower, on a small flat area on the side of the mountain. This page was last modified on 3 September 2018, at 23:20.